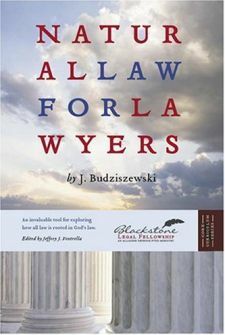 This short book – the fastest-moving of all my books on natural law, but packed in very closely -- serves as part of the curriculum for The Blackstone Fellowship, an organization of Christian law students. The Fellowship is an activity of the Alliance Defending Freedom, an association of lawyers who promote religious liberty, the sanctity of life, and the integrity of the family. For more information about the Fellowship, click here. If you would like to purchase the book from ADF, email info@adflegal.org . If that doesn't work, you can also get used copies in good condition through Amazon.com -- when the page for the book comes up, just click on SEE ALL BUYING OPTIONS.